V = forecast(Mdl,numperiods,Y0) returns numperiods consecutive forecasted conditional variances V of the fully specified, univariate conditional variance model Mdl. The model Mdl can be a garch, egarch, or gjr model object. The presample response data Y0 initializes the model to generate forecasts. V = forecast(Mdl,numperiods,Y0,Name,Value) generates forecasts with additional options specified by one or more name-value pair arguments. For example, you can initialize the model by specifying presample conditional variances. Forecast the conditional variance of simulated data over a 30-period horizon. Simulate 100 observations from a GARCH(1,1) model with known parameters. Forecast the conditional variances over a 30-period horizon, with and without using the simulated data as presample innovations. Plot the forecasts. Forecasts made without using presample innovations equal the unconditional innovation variance. Forecasts made using presample innovations converge asymptotically to the unconditional innovation variance. Simulate 100 observations from an EGARCH(1,1) model with known parameters. Forecast the conditional variance over a 30-period horizon, with and without using the simulated data as presample innovations. Plot the forecasts. Simulate 100 observations from a GJR(1,1) model with known parameters. Forecast the conditional variance of the NASDAQ Composite Index returns over a 500-day horizon using GARCH(1,1), EGARCH(1,1) and GJR(1,1) models. 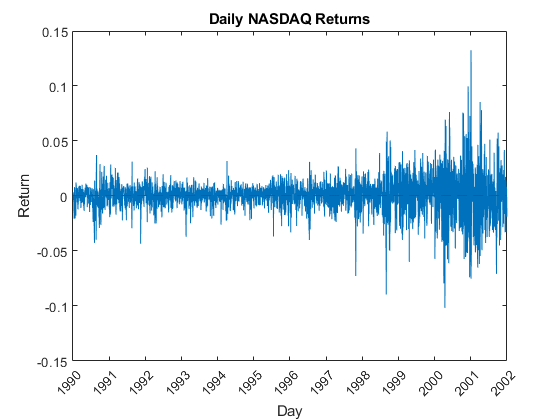 Load the NASDAQ data included with the toolbox. Convert the index to returns. Plot the returns. The variance of the series seems to change. This change is an indication of volatility clustering. The conditional mean model offset is very close to zero. Fit GARCH(1,1), EGARCH(1,1), and GJR(1,1) models to the data. By default, the software sets the conditional mean model offset to zero. Forecast the conditional variance for 500 days using the fitted models. 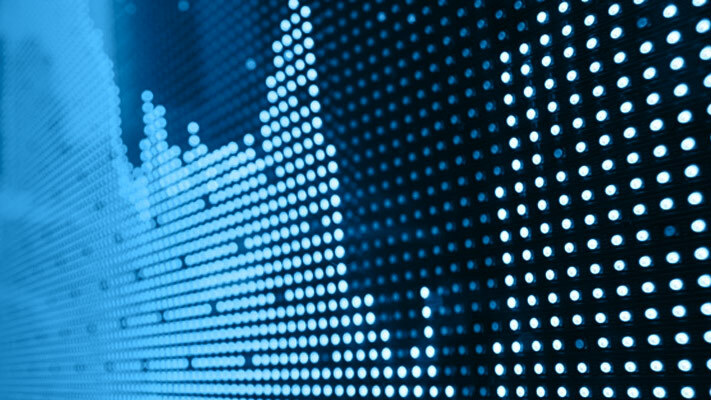 Use the observed returns as presample innovations for the forecasts. 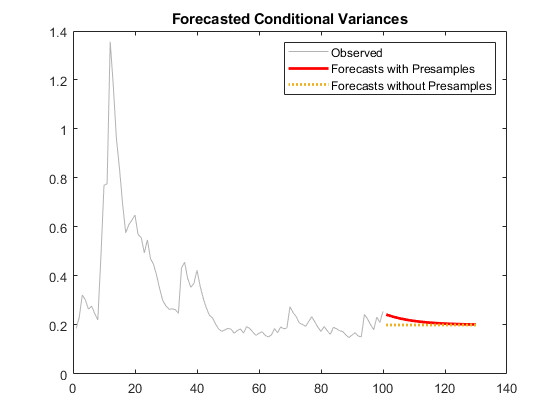 Plot the forecasts along with the conditional variances inferred from the data. Plot conditional variance forecasts for 1000 days. The forecasts converge asymptotically to the unconditional variances of their respective processes. Presample response data used to infer presample innovations E0, and whose conditional variance is forecasted, specified as a numeric column vector with length numpreobs or a numpreobs-by-numpaths numeric matrix. Y0 can represent a mean 0 presample innovations series with a variance process characterized by the conditional variance model Mdl. Y0 can also represent a presample innovations series plus an offset (stored in Mdl.Offset). For more details, see Algorithms. Rows of Y0 correspond to periods in the presample, and the last row contains the latest presample response. numpreobs is the number of specified presample responses and it must be at least Mdl.Q to initialize the variance equation. If numpreobs exceeds Mdl.Q, forecast uses only the latest Mdl.Q rows. For more details, see Time Base Partitions for Forecasting. If Y0 is a column vector, forecast applies it to each forecasted path. In this case, all forecast paths Y derive from the same initial responses. If Y0 is a matrix, it must have numpaths columns, where numpaths is the maximum among the second dimensions of the specified presample observation arrays Y0 and V0. Example: 'V0',[1 0.5;1 0.5] specifies two different presample paths of conditional variances. Presample conditional variances used to initialize the conditional variance model, specified as the comma-separated pair consisting of 'V0' and a numeric column vector or matrix with positive entries and numpaths columns. Rows of V0 correspond to periods in the presample, and the last row contains the latest presample conditional variance. For GARCH(P,Q) and GJR(P,Q) models, V0 must have at least Mdl.P rows to initialize the variance equation. For EGARCH(P,Q) models, V0 must have at least max([Mdl.P Mdl.Q]) rows to initialize the variance equation. If the number of rows exceeds the minimum number, then forecast uses the latest observations only. If V0 is a column vector, forecast applies it to each forecasted path. In this case, the conditional variance model of all forecast paths Y derives from the same initial conditional variances. By default, if Y0 has at least max(P,Q) + P rows, forecast infers any necessary presample conditional variances by passing Mdl and Y0 to infer. 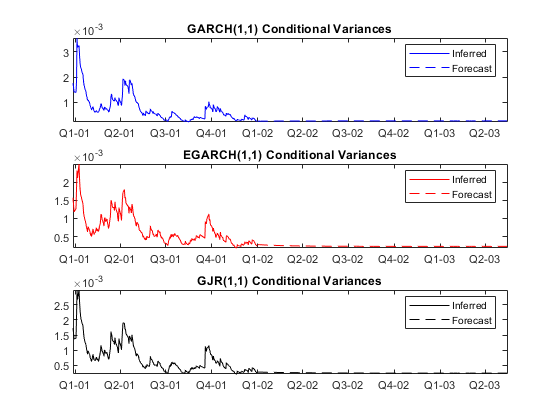 For GARCH(P,Q) and GJR(P,Q) models, forecast sets any necessary presample conditional variances to the unconditional variance of the conditional variance process. For EGARCH(P,Q) models, forecast sets any necessary presample conditional variances to the exponentiated, unconditional mean of the logarithm of the EGARCH(P,Q) variance process. forecast assumes that you synchronize presample data such that the latest observation of each presample series occurs simultaneously. Minimum mean square error (MMSE) forecasts of conditional variances of future model innovations, returned as a numeric column vector with length numperiods or a numperiods-by-numpaths numeric matrix. V represents a continuation of V0 (V(1,:) occurs in the next time point after V0(end,:)). V(j,k) contains the j-period-ahead forecasted conditional variance of path k.
forecast determines numpaths from the number of columns in the presample data sets Y0 and V0. For details, see Algorithms. If each presample data set has one column, then V is a column vector. Time base partitions for forecasting are two disjoint, contiguous intervals of the time base; each interval contains time series data for forecasting a dynamic model. The forecast period (forecast horizon) is a numperiods length partition at the end of the time base during which forecast generates forecasts V from the dynamic model Mdl. The presample period is the entire partition occurring before the forecast period. forecast can require observed responses (or innovations) Y0 or conditional variances V0 in the presample period to initialize the dynamic model for forecasting. The model structure determines the types and amounts of required presample observations. A common practice is to fit a dynamic model to a portion of the data set, then validate the predictability of the model by comparing its forecasts to observed responses. 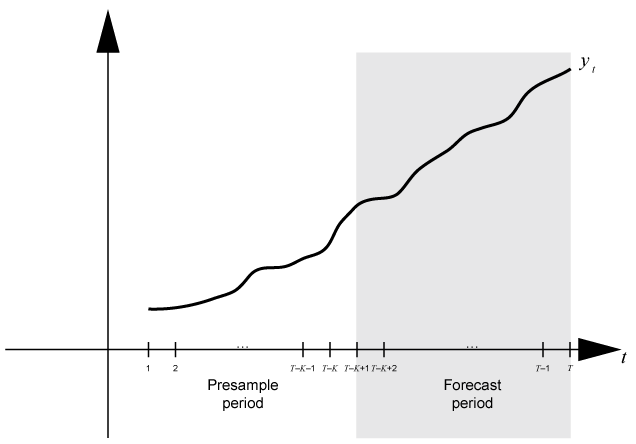 During forecasting, the presample period contains the data to which the model is fit, and the forecast period contains the holdout sample for validation. Suppose that yt is an observed response series. Consider forecasting conditional variances from a dynamic model of yt numperiods = K periods. Suppose that the dynamic model is fit to the data in the interval [1,T – K] (for more details, see estimate). This figure shows the time base partitions for forecasting. 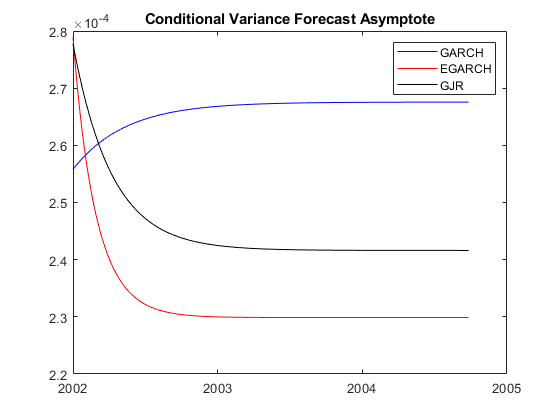 For example, to generate forecasts Y from a GARCH(0,2) model, forecast requires presample responses (innovations) Y0 = [yT−K−1yT−K]′ to initialize the model. The 1-period-ahead forecast requires both observations, whereas the 2-periods-ahead forecast requires yT – K and the 1-period-ahead forecast V(1). forecast generates all other forecasts by substituting previous forecasts for lagged responses in the model. Dynamic models containing a GARCH component can require presample conditional variances. Given enough presample responses, forecast infers the required presample conditional variances. This figure shows the arrays of required observations for this case, with corresponding input and output arguments. If the conditional variance model Mdl has an offset (Mdl.Offset), forecast subtracts it from the specified presample responses Y0 to obtain presample innovations E0. 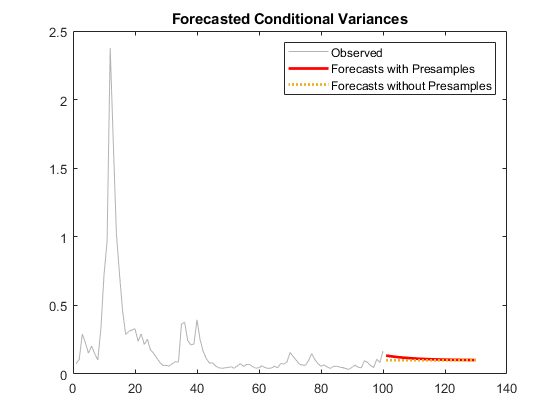 Subsequently, forecast uses E0 to initialize the conditional variance model for forecasting. forecast sets the number of sample paths to forecast numpaths to the maximum number of columns among the presample data sets Y0 and V0. All presample data sets must have either numpaths > 1 columns or one column. Otherwise, forecast issues an error. For example, if Y0 has five columns, representing five paths, then V0 can either have five columns or one column. If V0 has one column, then forecast applies V0 to each path. forecast horizontally concatenates the specified presample data sets Y0 and V0 such that the latest observations occur simultaneously. The result can be a jagged array because the presample data sets can have a different number of rows. In this case, forecast prepads variables with an appropriate amount of zeros to form a matrix. There are no plans to remove the previous syntaxes or the 'Y0' name-value pair argument at this time. However, you are encouraged to supply presample responses because, to forecast conditional variances from a conditional variance model, forecast must initialize models containing lagged variables. Without specified presample responses, forecast initializes models by using reasonable default values, but the default might not support all workflows. This table describes the default values for each conditional variance model object. garch All presample responses are the unconditional standard deviation of the process. egarch All presample responses are 0.
gjr All presample responses are the unconditional standard deviation of the process. Update your code by specifying presample response data in the third input argument. Nelson, D. B. “Conditional Heteroskedasticity in Asset Returns: A New Approach.” Econometrica. Vol. 59, 1991, pp. 347–370.